As promised I have a new batch of RadScheduler details for your viewing pleasure. If you were at TechEd then this is nothing new, but for the rest of you this is your first chance to see the early progress being made on Telerik's newest component. In short, the RadScheduler is shaping up to provide all of the features you'd expect to find in scheduling component. Recurrence, day/week/month views, drag-and-drop tasks- it's all there. So what will make RadScheduler different from existing scheduling components (other than obvious benefits of being a Telerik produced and supported component)? Quite simply, we are aiming to blend the best of "web 2.0" scheduling tools (think Google Calendar) with the tried and true features of traditional scheduling tools (like Outlook). 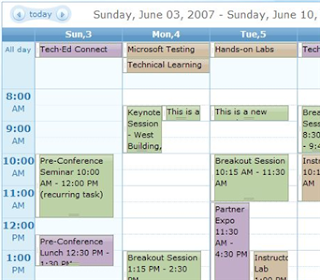 Many of the current scheduling tools on the market aim to replicate Outlook exactly on the web. While this will be possible with our component, we want our out of the box configuration to move past the "old school" dialog heavy scheduling components and provide a rich, interactive, Ajax-enabled scheduling experience. Furthermore, RadScheduler will also be a very flexible tool. You will not be locked-in to a Telerik defined data model, so it will be easy to use RadScheduler with your existing scheduling data. If you don't have existing data, you'll be able to drop a RadScheduler on your page (note: this is a single, easy to work with component instead of a complicated collection of components for scheduling) and connect it to an XML file for instant scheduling support in your web app. The first preview release of this component will be available in a few weeks and the "final" version will ship in Q2 (end of September). What do you think so far? This is looking pretty promising but there is more functionality that I would think that you need to add. I would like to see a timeline view and the ability to have resources and view on the resources. An example would be conference rooms. Take a look at the devexpress component they have these features. There is no doubt that more functionality will be added to RadScheduler before its release and in future versions. The DevExpress product you referenced is actually for WinForms. They do not offer a scheduling component built for the web. Still, we will work hard to provide many of these features in our own scheduling component. In fact, even its current form RadScheduler supports resources. You can bind the scheduler to any data source to load your resources and in turn attach them to tasks. There is no resources view, yet, but that may come in a future version. Hope that helps clear things up. I hope its alot better than Infragistics shedular!! thank you for your update on the long awaited schedule control. As we are a devoted Telerik customer and for the moment running a project for scheduling. We are in need of a beta version to run against. Any beta links ? Good timing on the question! There are not beta links today, but the first preview release has been scheduled for July 3rd. I will be posting more information about this release later today. Check that post for all the details.